Break out the calculator today. No, you haven’t missed Tax Day yet, it is National Pi Day. Make 3/14 the best day of the week by rewarding yourself with some local “pi.” Since just about the only folks excited by 3.14159265…. 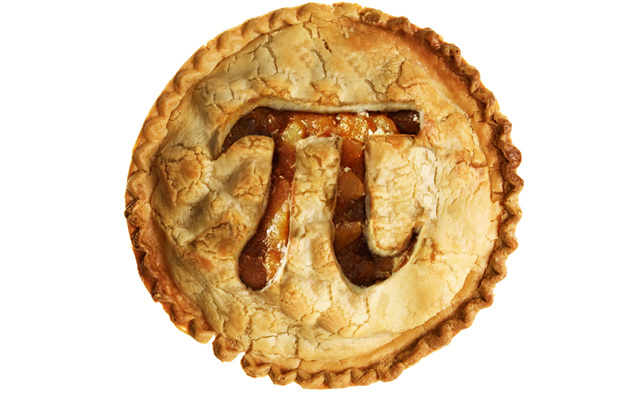 (ad nauseam) are the geeks from The Big Bang Theory, we’ve rounded up some options for pi that will have you celebrating the mystical mathematical symbol which represents a the ratio of the circumference of a circle to its diameter, π. Would you believe that putting ice cream on cherry pie was once illegal in Kansas? Luckily that’s not the case at the West Coast Tavern, located in North Park. Try a modernized version of the once-outlawed coupling with West Coast Tavern’s Brandied Cherry Pie. Filled with house brandied cherries, dusted with cinnamon and served with a crème fraiche gelato, it would be a crime to NOT indulge in this perfect pairing. Pi isn’t just for nerds and pies don’t always have to be for dessert. The Gaslamp’s barleymash offers a variety of their savory “barleypies”, an ale and barley infused flatbread. Toppings range from stout-braised short rib, arugula and horseradish cream, dubbed “The Shorty” to options ranging from spicy shrimp to duck confit. Stop in to try one of their delicious “Pig Pies,” topped with a tender pork belly confit, caramelized onions, a hint of barbecue, crumbled blue cheese, fried cilantro and Jameson-smoked paprika aioli. Originally a coal miner’s snack, the moon pie has been a popular indulgence since its inception in the 1950s. Today Union Kitchen and Tap is re-popularizing this American classic with their house made version. Marshmallow crème is layered between two graham cracker cookies and enveloped in chocolate. For their personal spin, each moon pie is tempura battered and dusted with powdered sugar. You may not have an RC Cola to wash it down with, but Union Kitchen and Tap in Encinitas more than makes up for it, serving each order of moon pies with a side sipper, their nearly famous to-pi-for Hazelnut milkshake. These pies are a Mathematician’s delight!